Served with basmati rice and cucumber raita. Chicken: bite-sized chicken breast pieces marinated for hours then broiled. Marinade: goat milk yogurt, toasted cumin seed, minced fresh garlic and ginger, lime juice, salt, turmeric, garam masala, black pepper, cayenne, paprika. 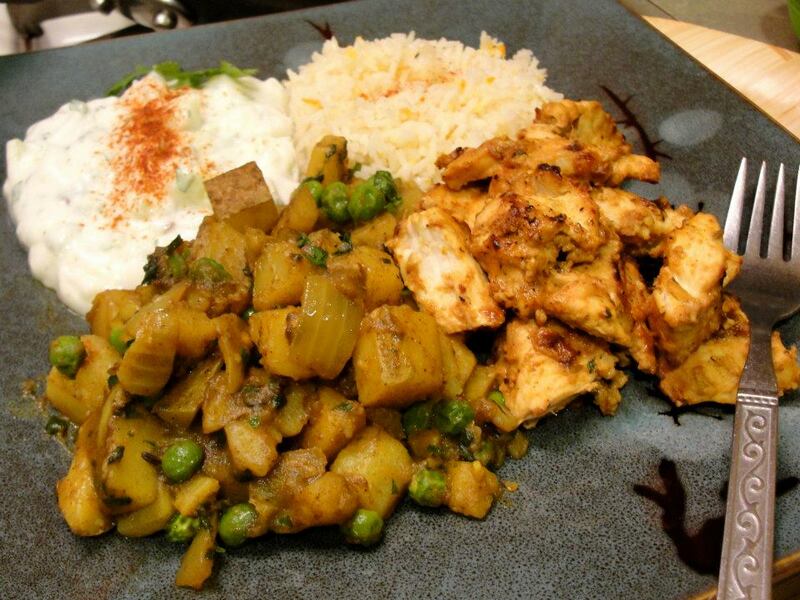 Potato: prepared in a covered skillet, with canola oil, diced russet potato, minced garlic, white onion, water, chopped cilantro leaves, fennel seed, hot curry powder, garam masala, salt, green peas (frozen).